Donald Trump is a businessman who has routinely hired foreign guest workers to staff his Mar-a-Lago resort in Florida, claiming it's impossible to find Americans to do the work. But his administration now wants to shut out foreigners who fill comparable jobs, which he now insists Americans would be happy to take. Consistency is not a Trump obsession. Nor is economics. Endorsing a Senate bill that would cut net legal immigration in half, he charged that the U.S. has "a very low-skilled immigration system" that "has not been fair to our people, to our citizens, to our workers." White House aide Stephen Miller said it's "common sense" that the hiring of lower-skilled foreigners takes jobs away from Americans and "drives down wages." Common sense said the Earth was flat. Superficial appearances can be grossly misleading. What is clear from experience is that low-skilled immigrants mostly take jobs that Americans don't want and that the effect they have on the wages of native-born workers is between slim and none. During the 1990s, the number of undocumented immigrants in this country more than doubled. The number of legal immigrants also climbed. But the economy added more than 23 million jobs, and the unemployment rate fell below 4 percent. The earnings of middle-wage workers rose. In recent years, by contrast, while the number of legal and undocumented immigrants has declined, the economy has grown more slowly. Job growth has fallen well short of the 1990s pace, and wages have been stagnant. First we proved there is no contradiction between welcoming immigrants and improving the fortunes of the average American. Then we showed that reducing the inflow brings no broad benefits. People who employ farmworkers, housekeepers, landscapers and seasonal employees already know how hard it is to attract native-born Americans to do these types of jobs. In Maine, a vacation destination, labor is so scarce that the tough-on-crime Republican governor actually let some prison inmates out to work in tourism-related jobs. Eric Haugen, who runs a Denver landscaping firm, told The New York Times he offers jobs paying $14 to $25 an hour, plus health insurance and other benefits, but rarely gets American applicants. "The labor pool really doesn't exist," he said. Sen. Tom Cotton, R-Ark., says there's a simple solution for businesses that rely on foreign labor: Pay enough to attract Americans. "Closing our borders to inexpensive foreign labor," he writes, "will force employers to add benefits and improve workplace conditions." Like his socialist colleague, Sen. Bernie Sanders, I-Vt., who wants to double the minimum wage, Cotton thinks employers can easily afford to be generous. But if the government chokes off the supply of foreign labor, American workers may not step in to reap rewards. Farm wages in California have risen 50 percent more than inflation since 1996, reports the Los Angeles Times, and growers are still waiting for that stampede of natives into the fields. 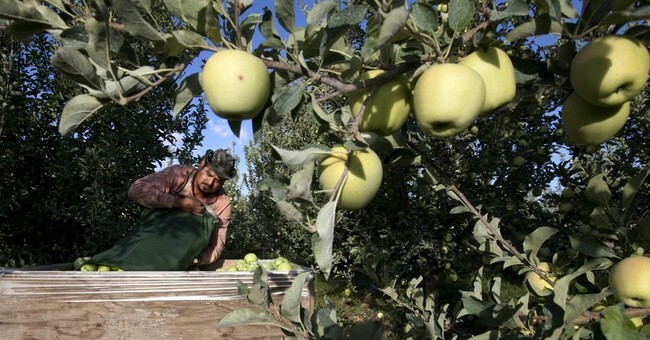 Nine in 10 farmworkers are still immigrants, and half are undocumented. Faced with the need to pay more, some farmers shift to crops that demand less labor, and some replace workers with machines. Some simply quit farming. California's production of asparagus, a labor-intensive crop, has largely moved to Mexico because it was hard to find workers on this side of the border. It's not as though employers can blithely raise prices to cover higher wages. The more businesses have to pay lower-skilled workers the more vulnerable they are to being underpriced by foreign rivals. Economist Veronica Nigh of the American Farm Bureau Federation says that in many instances, "either we import labor or we import food." When people come here from Mexico or China or Nigeria to work, they don't take jobs from Americans; they create jobs for Americans. When farmers can find workers, they grow food and fiber that has to be processed, packaged, transported and sold -- all of which boosts employment. When construction companies save money by hiring relatively inexpensive immigrants, they can build more houses, raising the demand for workers who produce lumber, tile, appliances, carpet and plumbing supplies. When a family finds low-cost child care, both husband and wife can afford to work outside the home, and the jobs they fill may need the support of additional hires. Some American workers will applaud if the federal government targets job-seeking immigrants. Those Americans will realize too late that when it hits that target, they can end up as collateral damage.